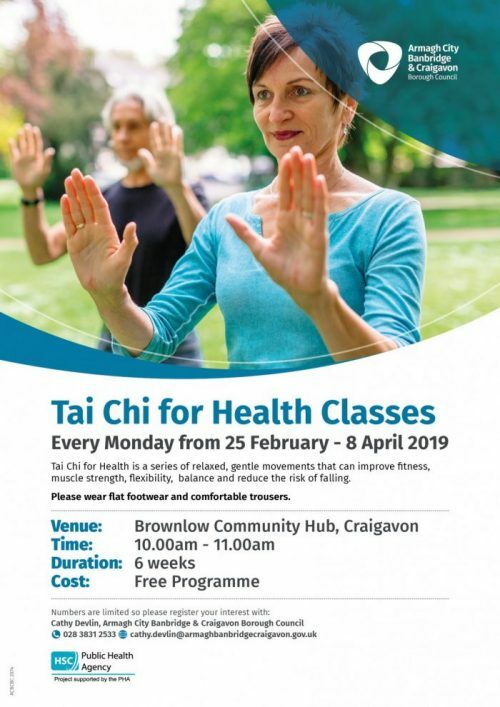 Free Tai Chi for Health classes will be taking place in Brownlow Community Hub starting on 25th February until Monday 8th April 2019 from 10.00am – 11.00am. Tai Chi for health is a series of relaxed, gentle movements that can improve fitness, muscle strength, flexibility, balance and reduce the risk of falling. Tai Chi is particularly beneficial for people with arthritis, however anyone can enjoy the health benefits of the programme. To book a place please contact Cathy Devlin on Tel: 028 3831 2533 or email cathy.devlin@armaghbanbridgecraigavon.gov.uk.